Lock in a great price for Vila Nova Hotel - rated 8.6 by recent guests. The room was comfortable with a good amount of space. The staff were very pleasant and helpful. They all spoke English very well which was useful for us as we don’t speak Portuguese. 5 mins drive from PDL airport, not in the centre of the city, but in Ponta Delgada you are never far away from anything. Taxis in Acores does not have meters so drivers can descide their prices and EUR10 is way to expensive. Hotel is modern and clean and staff are friendly. The lobbybar serves light meals, which was reasonable priced but undercooked. My room was with balcony and view to the pool and the Atlantic. You also have a view of the end of the runway so you will have a little noise from planes- just bring your earplugs (no noise in the night). Bed was 2 singlebeds put together, not confortable as a doublebed, but apart from that very comfortable and clean. workdesk, safe, sat. tv but no fridge/minibar. Wifi worked fine all over the hotel. Bathroom of good size and plenty of hot water. Breakfast served from 7am, plenty of choices in cold and hot items, fresh and coffee good. Staff not friendly. Short stay for me, but I could easily stay again. Great location, rooms simple and clean, good breakfast - delicious breads, croasants, very good espresso. We liked the breakfast, tidiness of the hotel in general, acceptable internet, excelent location. Breakfast was excellent and plentiful. Room was clean, large and well maintained. Staff were extremely friendly and helpful. Bed was huge and very, very comfy! One of our top picks in Ponta Delgada.Vila Nova Hotel is centrally located in Ponta Delgada, 0.6 miles from the Convento da Esperança. The hotel features air-conditioned rooms, a outdoor pool. Vila Nova’s guest rooms are decorated in blue and grey tones. They include extra long beds and a private bathroom with bathtub and shower. Suites also feature a minibar. Guests can enjoy a daily breakfast buffet and dinner in the poolside Atlantis Room. The Vila Nova bar serves exotic cocktails and crispy afternoon snacks. The swimming pool area has a large sun terrace with sun loungers and parasols. After a busy day, guests can enjoy a refreshing dive or play some billiards in the games room. Vila Nova is located 3.1 miles from Milicias Ocean Beach and 2.5 miles from Pope John Paul II International Airport. Vila Nova Hotel has been welcoming Booking.com guests since 24 Dec 2005. When would you like to stay at Vila Nova Hotel? 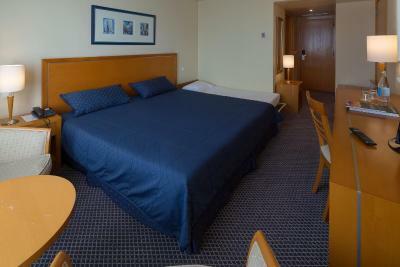 This spacious air-conditioned room comes with a view over the city of Ponta Delgada or the Atlantic Ocean. Each room has a cable TV and free Wi-Fi. 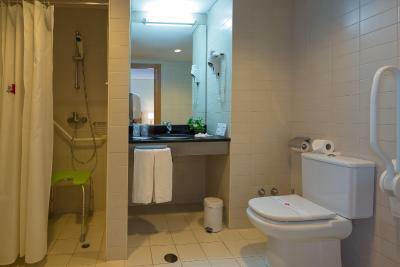 The room also offers a private bathroom with complimentary toiletries and a hair dryer. Public parking is possible on site (reservation is needed) and costs EUR 3 per day. This air-conditioned junior suite features a private bathroom with free toiletries, cable TV, desk and a seating area with a sofa. This triple room features a seating area, sofa and cable TV. 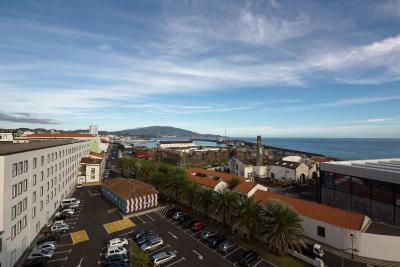 This spacious air-conditioned room comes with a view over the city of Ponta Delgada or the Atlantic Ocean. Each room has a cable TV and free WiFi. This twin room features a seating area, sofa and air conditioning. This twin room has a seating area, cable TV and sofa. This family room has a sofa, air conditioning and seating area. This single room features a sofa, cable TV and air conditioning. - Fireworks on the hotel's rooftop terrace (depending on weather conditions). House rules Vila Nova Hotel takes special requests - add in the next step! Vila Nova Hotel accepts these cards and reserves the right to temporarily hold an amount prior to arrival. Pillows could have been bigger and less 'lumpy'. Windows were somewhat 'salt-encrusted' from being by the sea so could have been cleaned more often. There is not a fridge. Although breakfast was very good, it wold be nice to have more options of fresh vegetables, not only tomatoes, but also cucumbers and etc. Also it would be good to have a fridge in a room. It would have been helpful to have a small fridge in the room. Although the hotel is in need of some updating, the staff keeps it immaculate. The breakfast buffet is very good with many selections and the parking charges are reasonable. 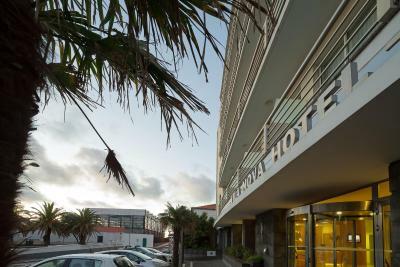 Overall, this hotel provides clean, basic lodging in a very central location in the city of Ponta Delgada close to everything. The staff was always super helpful in providing directions to local attractions and making dinner reservations. 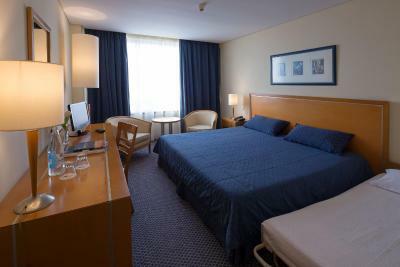 The hotel is also very conveniently located close to the airport and city center. Good value for the money. We were never informed that hotel car parking would be paied.